Registration is open for both for the Workshop and Short Course. See https://ippw2019.uk/index.php/registration/ for more information. The 16th International Planetary Probe Workshop will be held at Oxford University from 8-12 July 2019. As in previous years, the IPPW brings together scientists, engineers, technologists, mission designers, space agency representatives and students from around the world for a collaboration focused on exploring solar system destinations through in-situ missions. IPPW 2019 workshop will continue to build upon the IPPW tradition by encouraging international co-operation in planetary probe missions, the development of new and emerging technologies, and scientific discoveries. The Workshop on 8-12 July will be preceded on 6-7 July by a Short Course, on Ice Giants (Uranus & Neptune), which will be of interest to all members of the community. Topics covered will include an overview of current scientific understanding and open questions regarding the ice giants, mission proposals in development, science payloads for ice giant probes, and technologies for entry, descent systems. Further details about registration and other relevant conference news will be announced over the coming weeks on this website. For any questions please feel free to contact us using the contacts below. 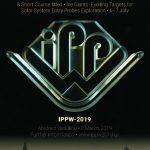 Click here for a printable IPPW 2019 poster, designed by Tibor Balint. Thanks, Tibor!